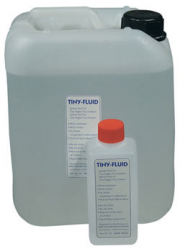 View cart “Look Tiny Fluid 2L” has been added to your cart. Due to the installation of a smaller, efficient pump, dimensions and weight could be reduced again.The fluid reservoir can be screwed directly into the machine. Thus, an external fluid tank and fluid tube are not necessary and the TINY FX only has two components: machine and battery pack. The TINY FX is called tiny, and its dimensions truly are tiny. In a small package (L = 9.8, W = 4.4, H = 3.4 cm) technology of outstanding performance has been realised. The TINY FX is a fog generator that fills the gap, due to its small size and its programmability. Because of its dimensions and weight (of only 180 grams), this little gadget can be easily built into backdrops, puppets, costumes and props etc. The heart of the generator is a programmable microprocessor which controls fog emission. State of the Art technology opens a wide field of applications to the user. For some applications it will be useful to program in a fixed fog amount. This can be done directly at the machine. The programmed fog amount can easily be reproduced and/or changed. 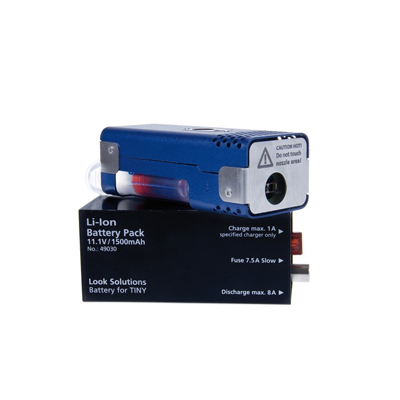 A compact battery (L= 10.5, W= 4.4, H= 4.1 cm) supplies the TINY FX with the 11.1 V supply. The small dimensions and the light weight of 200 grams ensures an easy hiding or installation. The modular design of fog generator and separate rechargeable battery ensure upmost flexibility for individual uses. 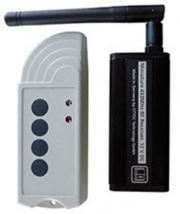 Because of an intelligent control mechanism the battery supplies energy only when necessary. Thus the fog time is greatly increased compared to other battery powered machines. The TINY FX is triggered with a start button which is integrated into the lid. 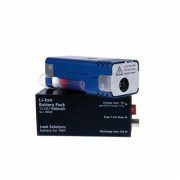 Also you can trigger the machine with the supplied cable remote or optional with a radio remote, a DMX converter or a Timer. The fluid reservoir for the generator will be supplied ready to use and filled with original Tiny-Fluid. The reservoir will be simply screwed into the machine. The reservoir can be refilled and therefor can be used several times. The Tiny-Fluid ensures dense fog is produced with the lowest of fluid consumption (2.3 ml/Min. at continuous output). Warm up time less than 1 sec.